Right at the end of the extremely dry period we had this summer I decided to do a little experiment: I started taking a photo of the patch of grass in my street in Manchester, in the North West of England, every couple of days. I study the effects of drought on ecosystems (see my previous posts about the effects of drought belowground here and here) and I thought it would be nice to show how the grass in my street would bounce back after the rain had started. Only… it didn’t. The rain did not come as intensely as I expected, and the grass did not bounce back as quickly as I expected. The first (top left) photo was taken on the 12thof July, the last (bottom right) on the 20thof August. And still you can see bare soil and brown patches! This patch of grass would look a lot lusher and greener during a normal Manchester summer. The grass in my street in Manchester this summer. But, more importantly, while aboveground plant growth seems mostly recovered, the composition of the community has changed (which you can’t see in these photos), and as I’ve shown in my research, this might continue to affect belowground communities and the processes they perform. Of course, this little patch of grass in Manchester is not that important for the functioning of our ecosystems. But it is a nice illustration of the impacts of an extremely dry summer on grassland and how long it takes for these fast-growing plants to regain their biomass! There is a heat wave in the UK, and at least in the north, where I live, not a single drop of rain has fallen for at least three weeks. I quite like it, especially since last year was basically one long, wet, windy autumn and I was craving for a real summer. But, with temperatures this high, and with this little rainfall, many plants are starting to look a bit poorly. Grass is turning brown, and forbs are hanging their heads. Especially in the north of England, where normally everything is lush and green around this time, this is an unusual sight. I know this all too well, because I am running a drought experiment – our drought pots have been tortured to the max and we wouldn’t have needed the sturdy roofs, while we had to water our control pots. Does this look dire? Then take a look at what’s happening belowground! Pots from my on-going drought experiment. So, plants are having a hard time, and I can imagine farmers are becoming worried. Because summer droughts are expected to increase in the UK, and when crops are stressed to their limit, this will lead to yield reductions. Modern agricultural crops have evolved to be adapted to high-resource, low risk environments, and have very different properties than their wild ancestors (read this great paper by García-Palacios et al.) – properties that are not much good for resisting drought conditions. Interest in characterising soil communities is booming, fuelled by the growing recognition that soil biota govern processes of carbon (C) and nitrogen (N) cycling – processes that underpin the delivery of soil-based ecosystem services such as climate mitigation and sustainable food production. Soils capture carbon, which can exacerbate climate change when released to the atmosphere, and they provide nitrogen and other nutrients for growing crops and feeding livestock – when these nutrients are lost from soils, they can pollute ground and surface water and cause a loss of biodiversity. Because soil microbes decompose organic matter, thereby releasing N for plant growth, and respiring C, they determine the balance between the release and retention of C and N in soils. In my work, I have a particular interest in the role of soil fungi and bacteria in these processes. Moreover, I want to find out how land use change and climate change affect the relative abundance of fungi and bacteria, and the chain of soil fauna that feed on them (the fungal and the bacterial energy channel, respectively), and how these changes in turn affect processes of C and N cycling. 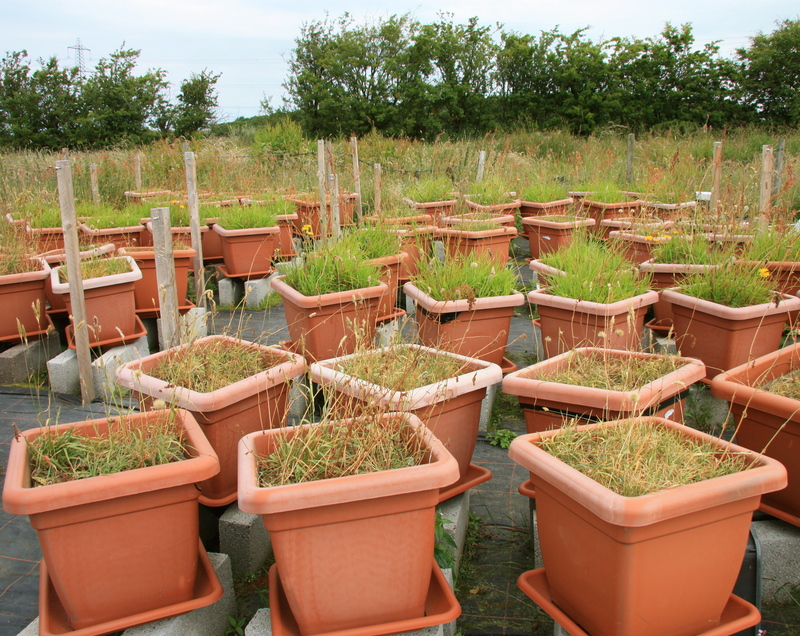 For example, some of my recent work shows that fungal-dominated microbial communities of extensively managed grassland retain N better and have lower N leaching losses, about which you can read more in this old blog post. Also, I have shown that fungal-based soil food webs and the processes of C and N cycling that they carry out are less affected by drought, which is expected to increase with climate change, than bacterial-based soil food webs. 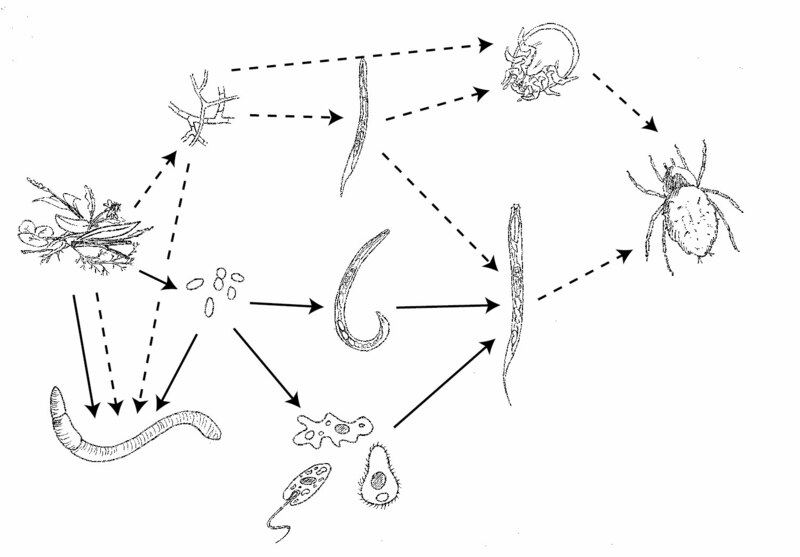 An example of a soil food web, with the fungal decomposition pathway (dashed arrows) and the bacterial decomposition pathway (solid arrows). Both fungi and bacteria are consumed by a chain of soil fauna, that consists of protozoa, nematodes, collembola, and mites.